To me, Guerlain Chamade Eau de Toilette is spring in a bottle. Spraying it is like encountering a bank of daffodils on a grey day and realizing birds are chirping and winter is on its last legs. Spraying Chamade you can practically see a bouquet of purple hyacinths, stems and all, materialize, complete with a hummingbird whirring in for breakfast. While snow pummeled the East Coast, it has been unseasonably balmy here, and crocuses splatter across lawns. It's Chamade season. If you've read anything about Chamade, you probably know that a chamade is the name of a pattern of drumbeat the French troops used back in the day to communicate retreat. It can also mean the pattering of heartbeats. It's a beautiful word, chamade, but I'm not sure I want my perfume to signal the need to retreat. Fortunately, Chamade's fragrance isn't likely to drive anyone away. The first burst of Chamade on skin is tart and grassy, then quickly sweetened with hyacinth and juicy black currant. Yes, it has the loft of aldehydes, but these aren't the classic Chanel type of sneezy aldehydes some people don't like. Instead, they're clean and soapy. The green fades but doesn't entirely disappear as it makes room for Chamade's sweet, floral heart. The rose is fresh and cool next to the fruity lilac. The black currant persists, but is spicier now, like an underripe plum. Chamade's drydown is more sophisticated than its cheerful, gamine beginning suggests. I definitely smell vanilla and sandalwood, but I wouldn't have guessed it is Guerlinade, maybe because of all the spring-like green and crisp fruitiness leading into it. Chamade's dry down smells Parisian — warm, aware of its pedigree, and like it has smoked a few cigarettes in its time. But still vernal. The Eau de Toilette initially has strong sillage but shrinks to the skin quickly, where it wears for a good half a day. Scentsa lists some of Chamade's admirers as Audrey Hepburn, Glenn Close, Princess Grace, and — my favorite — Phyllis Diller. I think it would also suit someone relatively young but with a classic style, like Anne Hathaway, or someone with a powerful Goth streak and a sense of irony. This review is based on a bottle of Chamade Eau de Toilette I bought about three years ago. It's the kind that comes with the gold, refillable canister with circles cut out of it (see above left). Guerlain Chamade is also made in extrait (see above right) and Eau de Parfum. For information on where to buy it, see Guerlain under Perfume Houses. Note: top images via Images de Parfums. (cooing) Oooooh, Chamaaaaade. Beautiful stuff. What I’ve got is a couple of decants of 80’s pdt and a teensy-tinsy 2ml bottle of parfum – and it’s just gorgeous. Green-and-gold heaven. I think it’s certainly old-fashioned, with a certain primness from that very-crisp galbanum, but old-fashioned is okay with me. The heart is so soft, and then I think the drydown is one of the loveliest ever. I like to smell florals on men, but I think Chamade would be a toughie for a guy to pull off. I’m really touched to think of Phyllis Diller wearing it, because I think of Chamade as being such a romantic scent. It takes so long to reveal its character, you almost have to fall in love with it. That extrait bottle is so lovely that I snapped up an empty one on ebay a few months ago and put my pdt into it. I even wore it several days in November, when I was writing it into my NaNoWriMo manuscript. But it’s still very snowy* here – not yet time to get Chamade back out of the cabinet. *Day 12 of no school… does anybody know where I can buy child-size muzzles? Somehow I see Chamade working for Phyllis Diller! Sure, Catherine Deneuve seems more of a natural, but I picture Diller in a pink chiffon, maribou-trimmed pegnoir with a cigarette in a holder in one hand, Chamade wafting through her Beverly Hills home. It’s such a lovely, lovely fragrance. Good luck with the muzzles! Can’t you get them weaving rugs or rolling cigars or whatever child laborers do? I agree on Phyllis, I can see it working for her – it’s just such a sweet image. Awwwww. They’ve been awfully productive! Maybe the duct tape IS the best option at this point. In my lower moments I am certain that I bear a resemblance to Phyliis Diller. It makes sense to me that we would also share a perfume. Nope – not seeing the resemblance. Not physically anyway – you’re as funny as she, however. Never underestimate the value of duct tape….I’m just sayin. Hey, maybe you could get them to make duct tape wallets and sell them at the flea market (just trying to think of a way to spin a dollar with all that energy and free time!). hmmm…a duct tape wallet…..I wonder if that could help curb my perfume spending? can’t get the credit cards out= can’t use them. oops, never mind—I have the numbers memorized! I have a little of the parfum in a bottle I bought at a garage sale. It is the perfect thing when I am wearing a dark suit, and a conservative tie. I have never been interested in wearing women’s clothing, but I love a little cross-dressing with my perfume. That sounds perfect! A terrific juxtaposition. This sounds so perfect and lovely I can hardly stand it. I can’t believe I have missed this, I don’t think I’ve ever run across even a description before. I will have to go searching for this one right away. I wonder if the Guerlain counters in the Swiss department stores will carry it? I’ve never worn plummy notes particularly well, though, so there’s no way I’m purchasing sans sniffage. Chamade is one of the Guerlain stand bys, so I’d think the Guerlain counter in any decent department store will carry it. Let me know what you think! Glad you are enjoying the warmth in Portland these days. Left Portland after 7 years there, and I’ve been in Switzerland 2 weeks, I’m having a little trouble adjusting to the cold. But I love riding the bus and all the different perfumes women (and men!) are wearing. My first impression is that people here care a bit more about wearing scents that they enjoy, instead of the scent-du-jour. Kari – I don’t get any plum on my skin – just lots of galbanum, hyacinth, black currant, and of course the Guerlinade dry down. But definitely try it first. I think you’ll love it. It’s a good one. Besides, you need a fragrance to remember your first days in Switzerland by. I don’t get plum either. Fear not. What a change! It sounds terrific, though. I’m jealous. If so, it’s a very fitting home for Andy Tauer! Most certainly! I’m excited to go and visit his shop, though I feel a bit timid about how few of his scents I’ve tried. But it will be my first time to try and discuss perfume in French, and I.die. for his Le Maroc Pour Elle. Then you’ll love getting to know the rest of his scents! And I bet his English is perfect. Reporting back! I walked into the first pharmacy I saw downtown ( I don’t have time yet to go into Globus, the nice department store.) I was thrilled to see all the Guerlains they had there! I tried Chamade, but I’m afraid it’s not love so far. I was expecting more floral, maybe? I actually think the sample bottle might be old, because it smelled really quite… stale? That may also be due to having to spray onto paper. It took about 30 minutes for the stale smell to burn off but now I get a nice greenGREEN powder. I ended up falling instead for the Jardins de Bagatelle, which I’d never tried before, either. Then I was distracted by the display of over 20 Serge Lutens! In a “pharmacie!” wow. I love living in French-speaking Switzerland. Great! Chamade is definitely green, but should be loaded with hyacinth. I find it more soapy than powdery, too. Still, it just might not be your thing. How great to have pharmacists with such a fabulous selection of perfume! I can’t even imagine what the department stores might stock. Have fun! Suited for ‘someone with a powerful Goth streak and a sense of irony’ you say? Sounds like something I need to sniff. Right now as DC recovers from the Snowpocalypse, a little spring sounds just like something I need. And it’s Guerlain, you can’t go wrong with classic Guerlain. It truly is gorgeous. Just like bringing home a spring bouquet and opening the windows for the first time in months. I ordered the edp, from perfume1.com, and I want to know how does the edt, and edp compare? (I love the edp, and thanks for the wonderful review). I wish I knew! All I could do is guess. Guerlain, especially, seems to like to play around with the different formulations. Oh darn, now I wish I had an available wrist for a spritz of chamade….mine is in one of those oogli black metal refill cans, left over from a split I did a while back —I should probably empty it into a nice atomizer ; I hadn’t thought about the poor dear’s feelings—but today is all about Divine by Divine— can I wait til tomorrow for some Chamade? hmmmm probably not….no patience, you know….off to find some skin real estate for a spritz of Chamade. Thank you for the lovely review Angela —it helps me, looking out at my frozen, snow covered yard, to imagine crocus blooming in yours…. Divine is a good one, too! It really is freakishly warm here. I bet we’re due for a late winter snowstorm to balance everything out. Be still my beating heart – I check in after lunch to find a review of my spring/summer HG scent! Thank you so much Angela. I have a bottle of the extait (I was a sucker for the beautiful bottle and also the fact that Guerlains are always better in extrait) and I find the Guerlinade to be very evident in the drydown. Snowing to beat the band her today so I’ll have to wait a while longer to pull it out. Alas, I cannot accept a stone that is not rightfully mine… I’ve never even smelled that one so someone else gets the credit there. well, I am truly mystified then….. the mystery swapper…..an unclaimed enabler’s shiny stone…. meanwhile , I’ll send you some Un Crime Exotique for a sniff test. You have too much snow—you need warm perfumes! Oh–I know you can’t have carnations touch your skin, but I’m going to send you a sample of Lorenzo Villoresi Donna to sniff or dab on something that won’t get welts…like a piece of fabric. I tried the extrait once and was completely bowled over! I’m so glad you have a bottle. I bought a 1/4 oz parfum spray, took it home, then discovered it had dried out. Heart heavy, I returned to the store and swapped it for the EdT I have now. It would be great to do a side by side comparison. The one I want to do a side by side comparison with is the older Parfum de Toilette. I have a serious lemming for a bottle, but I’m very fiscally conservative and I now have more perfume that I’ll ever use so I haven’t been able to actually justify a purchase. I know just how you feel. I have some of the PdT for Mitsouko, but not this one. Anglea, I’m experiencing Spring vicariously through you today. Thanks for that, cause it’s the only way I’ll get a hint of it any time soon. I can’t beleive I’ve never tried Chamade, but there you go. It’s been on my list forever – time to get with the program! Thanks for the lovely review. Really, you must give Chamade a try, if for no other reason than just to know it. It’s such a classic, and I’d love to know what you think of it. Retreat!!! It has Guerlinade, that’s enough to make me run far, far away. As always though, your lovely writing makes me wish it didn’t so I could try this for myself. You just saved yourself some money, at least! And there are lots of gorgeous spring scents out there. No retreats! Just that pounding heart that the newly in love so often have–as signified by the lovely parfum bottle. Marvelous! Someday I’ll have some of the parfum for sure. Keep an eye out for those little collections of Guerlain parfum minis–that’s where I got mine. In fact, it was what started me off on the whole vintage perfume thing. And it was so reasonably priced that I scoured *bay until I found a second one and snapped it up! What a lovely review: thank you, Angela! I’ve not paid much attention to Chamade in the past, although I was given an empty bottle of EDT to play with as a child, and I still have it. It’s often compared to Le Temps d’une Fete, which I love and wear often. If anyone is familiar with both scents, may I ask for a comparison please? I’ll see if I can find my sample of it and get back to you! You are so kind. Fingers crossed! After half an hour or so of Le Temps d’une Fete, I smell more wood and muted narcissus in that one and more cassis and hyacinth in Chamade. Chamade is more fruity to me, for sure, and more vanillic. Le Temps d’une Fete is gorgeous, darn it. Time to start saving up for a bottle. Thanks Angela, this is amazingly helpful. I’m certainly going to give Chamade a whirl next time I’m at a decent Guerlain counter, but it sounds like Le Temps is more my kind of thing. It truly is beautiful, and luckily quite inexpensive! I love both, Cap – although if I HAD to pick just one, it’d be LTdF by a “nose.” (Hah! I kill me!) Well worth trying both, I’d say. Ch spends a lot of time in the opening phase, pretty much alllll galbanum on me (I have the pdt and parfum) for about an hour before the florals open up and it’s like a garden blooming in front of your nose. Then the drydown is all powdery mimosa – creamy vanilla, beautiful. LTdF morphs a lot less on me: you get your galbanum and green stems and then haylike narcissus, ending in a smooth woody-mossy base with benzoin. It’s a lot drier, and I’d say perhaps less floral – I don’t actually smell a lot of hyacinth in it. I think its narcissus is less crisp and wet than Chamade’s hyacinth, and its green is more mossy green than galbanum green. Thank you to both of you! This is exactly what I wanted to know. Ah ha ha, by a nose! I have both…both are waaaaay up on my list of favorites overall, and clear and away the green floral champs. I, too, find Chamade to be much more the shape shifter; more powerful richness overall and in the end, but as we know, that is just an observation, and not a value statement. I think I’m going to go do a Fete vs Chamade wrist myself. They really are both gorgeous. ScentSelf, thanks are due to you too! I find shape-shifting scents very appealing. Thank you for a lovely review Angela! Chamade has been on my short list of Guerlains to try (along with Apres l’Ondee) for what seems like a very long time. They just don’t stock either of the two at my local Neimans or Saks, so I may have to break down and purchase a decant of each. I have had difficulty warming to the much-idolized and standard Guerlain scents Mitsouko and Shalimar, but I do love L’Heure Bleue. Chamade and A l’O just sound like Guerlains I could love despite my problems with the classics, and your review makes me even more eager to try. My only concern is the aldehydes- but it sounds as though they are not very aggressive. I am ready for some beautiful new spring scents!!!! Chamade is more fresh and green than the other Guerlains you mention, and its juicy fruit makes it (I think) more approachable. I don’t find the aldehydes all that demanding in Chamade. Am I truly lemming this or just craving some Springtime, I wonder? Thanks for the lovely review, regardless. This sounds a bit like Balmain’s Ivoire, minus the soapiness? Would that be a fair comparison? If so, it’s going on my must-sample list. I find it more floral (all that crisp hyacinth!) and sweeter than Ivoire, but with the same green edge, for sure. Definitely worth a sample, for reference if nothing else. I don’t think it’s much like Ivoire, except for the galbanum. Ivoire’s got all that moss – I like it very much, but the weather has to be very humid for me to attempt it. Otherwise the soap and moss just fight each other and the florals get bruised. Okay, could someone please tell me what is this Guerlinade ‘note’? I don’t get it. Hi, Sarabeth! “Guerlinade” is a blended base that’s classically added to Guerlain scents and it consists of Orris, Tonka Bean, Vanilla, Musk and Sandal (is Vetiver and Ambergris also Guerlainade ingredients? Can’t remember). It lends an oily-sweet, rich base with a mineral kick. It smells almost like vanilla smashed with powder and cooking oil. This inclusion of a rich, warm-sweet scent, is pretty characteristic of Guerlains; although, some of the soliflores or water splashes don’t necessarily include it in any volume. Also, as Robin has mentioned in other posts, modern blends are dependent upon synthetic impressions of classic “notes” (essences and essence blends) and I’d be surprised if modern Guerlains had any “real” (non-synthetic, original blend) Guerlainade in them. Synthetic doesn’t necessarily mean inferior, but original, non-synthetic Guerlainade is very distinctive. …and the musk is certainly not “natural”, as original Guerlainade base had “Tonkin Musk” in it (of real, animalic origin) which is now illegal to obtain (it’s not illegal to use musk that had been obtained before this restriction; albeit, there are some restrictions on using certain volumes of essences in fragrances sold in the U.S., due to public health standards regarding allergens). …and now I’m thinking “Rose” was also included in it. Anyhow, the Guerlain fragrance with (classically) the highest level of Guerlainade, has been “Shalimar”; if you ever get your hands on an older batch of it, you’ll notice the sugary-sweet, creamy-woodsy base, which would be the natural qualities of the Mysore Sandalwood being enhanced by the Guerlainade base. As a result, the dry-down of original “Shalimar” ends-up smelling very oily-smooth and creamy. Thank you NLB! Wow, it sounds beautiful (and for all intents and purposes obsolete at this point). I suppose that is why people want to get their hands on the older stuff. I always thought older fragrances had basically ‘gone bad’, and they are worthless at this point, but if they contain original non synthetic ingredients (the original Guerlinade) perhaps still wonderful? I like the idea of a ‘fresh’ bottle of perfume, but these days I am not so sure, they seem to be missing some important aspect of the perfumery of the past. Lots of old fragrances, with synthetic and natural ingredients, stay in great shape if they’ve been kept cool and in the dark. Never fear to sniff something at an estate sale–you just might find something terrific! Besides all of Nlb’s thoughtful response, click on the link embedded in the review for some of Robin’s info on the Guerlinade. Also, it’s supposed to contain a hint of iris. After wearing lots of the classic Guerlains, you start to recognize something similar in their creamy, sweet drydown–Guerlinade! I discovered Chamade last year, and purchased the EdP. Love, love, love it! What about a retreat as in vacation instead of retreat as in giving up? Chamade is definitely a vacation for me – as is any scent that I love. A sniff of the wrist is like a mini-vacation, isn’t it? Cheaper than therapy – or a cruise. Wink wink. Hey, that’s a good way to look at it! another question, Angela. On the Guerlain website Chamade is only listed under Les Parisiennes as a Pour Homme. Have they discontinued the Pour Femmes? It’s there! I just saw it yesterday when I did this post. Let me see if I can find the link for you. Well, I just looked at the page (it takes forever to load!) and I couldn’t get the fancy parfum carrousel to spin to its second selection of fragrances, where Chamade is. But it’s there. I’ll try again a little later and see if I can post a link. I wonder what it is that doesn’t work on you? Oh well, money saved. There’s plenty of other perfume to buy out there, that’s for sure. I can’t pinpoint the exact note. It’s more like pickled narcissus more than anything, with hints of powder. How odd! Yikes! Definitely something to avoid. Sounds like it might be the black currant bud – it can be bitter. So sorry for you, but as someone said above – there are plenty of other beautiful spring scents. This sounds beautiful as we wish for the sun to stay. How does it compare to Mitsouko or are they are a totally different plane. I love Mitsouko, but have never tried Chamade. Guess I go read the reviews. They aren’t very much alike excepting a tenuous resemblence at the base (but that may have as much to do with what version of Guerlinade your Guerlain has). Ah, yes. Reformulation raises it’s ugly head…much to our chagrin. I’ll have to take a trip to Neimans to try the Chamade. Our local Sehora has stopped stocking much of what I like. Mitsouko, Guerlain Vetiver, Hermes (anything). I suppose the recession hit everyone…supply and demand. I bet Nieman’s has a fun selection, though! I’m with Monkeytoe–Mitsouko and Chamade are worlds apart. Chamade is much more approachable and sunny. What a perfect first crocus of spring kind of review. As I mentioned above, I like to wear it, like most “girly” scents, when I am dressed most conservatively masculine, which for me is a suit. Noting compliments a navy chalk stripe suit like Chamade (or Drole de Rose for example). I have read about the Chamade/Sagan connection, but the Guerlain website talked about the “drumbeat” connotation of chamade, so I let it be. Isn’t it a great word? Angela, thank you for this review! Chamade is by far my favorite of the Guerlains I’ve tried. Have any of you taken the quiz on the Guerlain website? It tells you whether you are a “Seducer”, a “Dare”, a “Freshen Up”, or a “Smile”. I came out a “Smile”, and Chamade was one of the recommended fragrances for me. I have only tried the parfum (I have a teensy-tiny bottle now), but I think I need to try the EDT. What I like best about Chamade, so far, is the pollen-y aspect. It makes me think of a springy yellow-green color, and it does indeed make me smile! I did take that quiz a long time ago–I should take it again! I think I was trying to game it so it would deliver up Vol de Nuit. I love it that you’re a “smile” though! I wasn’t surprised. My main purpose in wearing fragrance is to make myself happy! However, I can see wanting to guide the results toward Vol de Nuit. I love the whole idea of that fragrance! Angela, this is a nice and timely review. I’ve owned a swap decant of Chamade (I think edt) for a few months but only recently gave it a proper wear. I’m now wearing it again as I head out and about to do some afternoon business. To my nose, and after looking at the notes you listed, I find a very obvious Guerlinade base that remind me of Nahema, but much more so of the woody-vanillic amber of Attrape Cœur. The top is a lovely, fleeting green, but I would have never guessed aldehydes, so I agree with you that there’s no similarity to any aldehydic Chanels. This smells lovely, but not at all airy, and I’ll pobably never really want to wear it on a warm, 70°+ day like we’re having here now. However, I can’t tell you how perfect it was on a rainy, slightly chilly late afternoon a little over a week ago when I absolutely learned to appreciate the beauty of Chamade. I would pronounce this the perfect fragrance for a walk in the spring rain, or on a just-barely-balmy April early evening, followed by a cozy cup of black tea. It starts out green, yet becomes warmer as the drydown arrives. I confess that on a (too) warm day like today, I crave something that retains the green, dewy floral bouquet of the top notes. That such a great mini-review! I can definitely see how Chamade could get overwhelming in heat, especially in the first half hour it’s on (it wears down on my skin pretty quickly). It has a lot of presence. But in a spring rain–perfect. if you’re talking about the one from me, it’s Edt and the code on the bottle is UEOAS —didn’t we determine that it was from the 90’s ?? It does smell lovely. And lasts a long time compared to many fragrances in Edt—-I’ve had this one spritz on my forearm most of the day and it still smells strongly of hyacinth, daffodils(?) and galbanum….. good stuff. Yep indeed, the one from you! I forgot if we discussed the vintage. But it’s the one about which I said, “Did I really ask for this? I must have lost my mind.” I’m glad to have it though! Interestingly, no attempt in perfumery ever smells as good or as true as “true” hyacinth — that deep-rooted smell of Easter in the house — to me. It’s one of those difficult accords like lilac. Why oh why did I not wear Chamade today? I wish I’d read this review before applying my SOTD. I bought a bottle of Armani Prive Cuir Amethyste for $6 yesterday, and I now smell like a vinyl recliner. I foolishly made the comment that $6 wasted wouldn’t be a big deal if I didn’t like it, but now I’m changing my mind. $6! Cuir Amethyste!! Mercy! If you tire of the recliner feel, get that bottle to me and I’ll make it worth your while. I’m sure it will makes it way to you. Miss Kitty: I’d gladly take even a small decant of vinyl recliner in swap or whatever. That sounds kind of good to me. Send me a note a MUA. I’m not sure how much is in it, but maybe I can split it between you and Angela. I wish I had mine on, too, although on a whim I spritzed Eau de Campagne and I’m very happy with it on this near 70° day! So warm! Perfect for fresh Eau de Campagne. Isn’t the whole chamade/retreat thing meant to be about surrender to love or some such thing? I’ll admit it, I’ve never given this one a proper wearing. I tried it on paper and put it down as Guerlain’s rendition of the same theme as No19 – a green floral which simply doesn’t feel right on me. Still, the notes sound great on paper so I might give it another chance and test it on skin in a few weeks’ time. Who knows, it might fare better when the spring is in the air and the daffodils are out. I’m sure you’re right about retreat and surrender. But I’d rather they lay down their weapons and approach rather than run away! It’s all inspired by the same surrender. I can see why you might equate No. 19 and Chamade, especially with all that crisp green, but I find them plenty different. Chamade is juicier and more approachable to me–more joyful and less intellectual, I guess. I hope the daffodils come out soon! Hmmmm…. how many companies go through that these days?? Good question. Another question: would Guerlain even go through that now? I’ve acquired quite a little collection of Chamades from various eras in various concentrations, and I’ve got a few of them on me right this moment to compare them (and thanks to you, dear Angela, for the evening’s fun and frolic: my favourite thing to do while I’m reading a good book). At the moment, my favourite version is the vintage Chamade edc, of all humble things!! Who woulda thunk? The vetiver in this lovely. Joe is right on with the allusion to Nahema in that abstract rose note. The combo of green blackcurrant bud and fruit is its own vivid sharp-sweet study in contrasts, and the hyacinth is that sweet, purple, almost over-ripe kind. I see this particular Chamade in colours in my mind: green, deep pink-rose and purple. There’s a lilac note that almost borders on a violet leaf, probably because the composition is already leaning towards the green. Overall, it is incredibly focused and bright. Not sure how hard the vintage edc is to find, but for any hard-core Chamade fans it’s a must-try, and probably fairly inexpensive in the grand scheme of things. It’s interesting you like the EdC the best, because the old EdC is my favorite formulation of Mitsouko, too! I really think they made some wonderful EdCs in those big, round bottles. Angela, I think that the edc concentrations are generally terribly underrated. Pity. If they happen to be vintage, they can blow a girl or boy’s socks off! Yes, those round Guerlains are fab, aren’t they? Also, I have a sixties Chanel No 5 edc that is intense, remarkably complex AND even long-lasting — and it doesn’t have more than a whiff of those No 5 aldehydes that make many versions of the scent quite unwearable on my skin. Another great edc is Diorling. Whoah! They sure weren’t shy about scents back in the “olden days,” were they? Bring on the leather whips, sistah!!! I love the old Diorling! I need to put some on right now…. Wow, Robin R., you paint a gorgeous picture of the vintage EDC. I love the idea of the changing colors. Sounds like a must-try! I do hope you can find some, Miss H. Maybe Angela will find us a few bottles; she has a certain way with thrift shops. They have a tester of EDT at my Nordstrom and on paper, it knocks me out. Blackcurrant is a note I try to avoid but… it’s Guerlain…. Chamade definitely has plenty of presence–at least at first. But it’s worth a try on skin, I think. As you say, it’s a Guerlain. Black currant! Sounds wonderful; I already envision myself wearing an airy cotton dress and doing my best Audrey to go with it! Thanks for the lovely read. Nice image! If you do try it, I’d love to know what you think. I sure wish it were the season for airy cotton dresses right now. 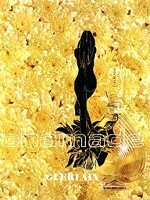 Chamade (edt) was my first Guerlain, purchased on vacation in SF in ’94. Nahema would have had the honor earlier that year but I bought it on first sniff on basis of the rose, only to walk it back to Saks 20 min later when it faded and I didn’t like the tropical fruits that followed. FYI – I bought a bottle of Nahema late last year – I love it now. But back to Chamade – I fell in love at first sniff. That sparkling mix of hyacynth, black currant and Turkish rose surrounded by the greeness just took my breath away and I had to had it. I learned to love the heart and the drydown in time. I put it in the same class as First (the 1977 perfume vintage), same feel of the epitome of elegance. Took me years to pick out the hyacynth and rose, but who care about individual notes when the whole of the bouquet is so spectacular? I wore it year round. Still have the edt pour bottle, now empty, and picked up a tester pdt bottle last year on fleabay (don’t think they make the 75ml size any more) and also have a 2ml perfume from a mini collection box from the ’90s. I find the edt to be closer to the perfume. Pdt seems to go to powder faster, in my opinion. I’ve no idea how the formula of today compare with the one from the ’90s, but what I now have should last me a good long while. Thank you Angela, for writing this review and giving me a chance to relive my memories of one of the most beautiful perfumes I know! What lovely memories of Chamade! It’s a wonderful perfume to have good memories of (so is Nahema). This sounds wonderful–is it something a male could wear comfortably? It’s such a shame that so many “masculines” smell so terrible. Obscura: For whatever it’s worth, I find this quite flowery and feminine. Then again, I will wear almost anything “comfortably” as long as I adjust my application. Chamade is not something I’d wear on a daily basis, but it’s not anything that made me feel overly self conscious in public. Again, judicious application is key. I was thinking yesterday that a scent with a similar “old fashioned” vibe but much more green, overlaid with much more subtle florals, is vintage Vent Vert by Balmain. Any man could easily wear that one. It rates pretty high on the femme-meter, but then again I do love a pretty scent on a man. It’s so unexpected. oh Angela, I love your reviews, and I can imagine how it smells like. I have in my nose so to say. And I know I would not like it. I can appreciate it, I am rather conservative in style, but then you have to destroy this with a crazy scent. I know just what you mean! The combination of crazy scent and conservative style is so chic. You were so brave to buy it unsniffed! But you’re so right–the bottle is beautiful, and I bet you will love the fragrance, too, especially if you like Nahema. Enjoy it! I’ve just snapped up a nearly full 30ml n EDT on eBay for a very reasonable price. In an exchange with the seller I learned that she had received it years ago as a gift but never quite liked it. Recently she contacted Guerlain to ask about the code on the bottom of the bottle. They got back to her with a date of 1993, which is great for me to know. The bottle is not pretty tho. I’m still getting used to the fragrance. My perfume perceiving brain is quite confused. Is it sweet or dry? Warm or cool? Welcoming or haughty? My normal guides to judging perfumes are all scrambled. On the whole I find it on the sweet, warm and welcoming side, but also crisp and fresh. It’s fantastic when a perfume can reconcile apparent opposites like this. Those are the ones that really are works of art. Thanks for the review Angela. You bring up such a good point about balance and reconciling opposites, and about surprise, too. They’re all so important to good perfume. I’m glad you’re liking it!